Barnabas Tew is a Victorian detective with his assistant Wilfred Colby find themselves in Xibalba. It is the end of the Mayan world and time for Uncle Rabbit to resurrect the world again. But a couple of demons are determined to prevent this from happening. It’s going to be up to the bumbling Barnabas and Wilfred to bring Uncle Rabbit back to life and keep the world from going to hell, literally. This is the first book I have read about Barnabas and Wilfred and I am hooked. Grumpy Barnabas falls into bad luck and clues alike. Thankfully he has Wilfred to save him and keep things on track. I loved the Mayan mythology and enjoyed the different legs of this odd journey. 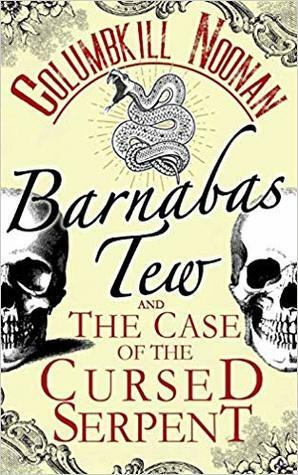 I really enjoyed Baranbas Tew and the Case of the Cursed Serpent. It was a great mystery that kept me guessing and hoping that our heroes would survive. I do think that reading this series in order would give more to the story but I didn’t have too much of a problem following along. This is a great mystery and one that I recommend checking out. Now I have to go catch up on what I missed.